An electric fence is a circuit. The current passes through the wire to the animal or long grass, then via the earth stakes in the earthing system, back to the unit. The electric fencing offers many advantages over conventional fencing. Firstly, electric fencing is economical (50% less costs/ labour), in terms of material and work. You can install electric fencing yourself or get a contractor to do it for you. Electric fencing is also a psychological barrier. Your animals will avoid it after their first contact. Because of this, your electric fencing is very effective, and more safe than a fence that’s not electric. 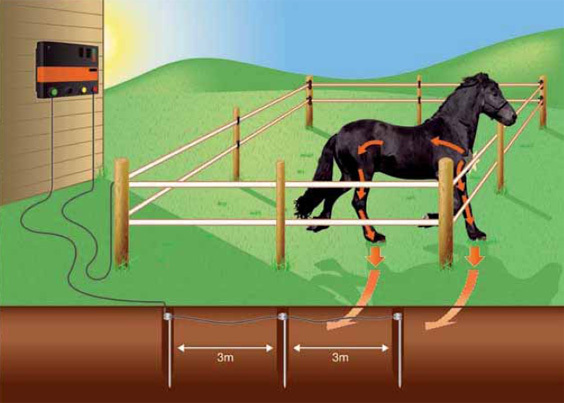 This means that the physical load on an electric fence is virtually zero. Result: Increased service life!